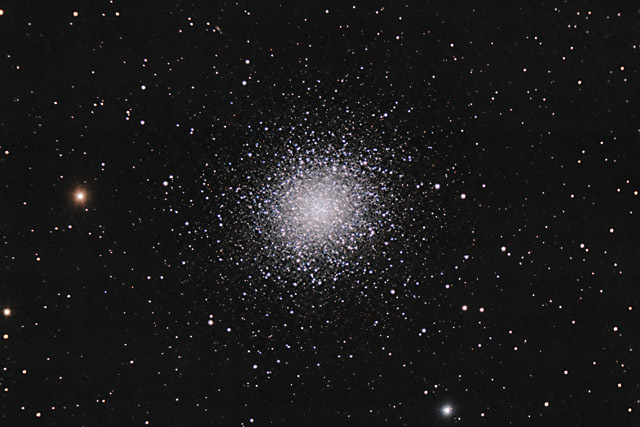 M13 is one of the most impressive globular clusters in the sky. The cluster is about 25,000 light years from Earth, and contains several hundred thousand stars. 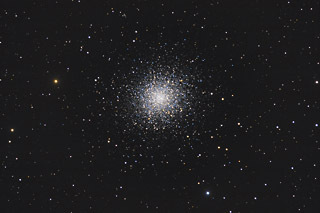 M13 subtends about 20 arc minutes in the sky, which makes it about 2/3 the size of a full moon. If you look closely, you can see the small galaxy NGC 6207 at the top of the image at about the 11:00 position. Software Used Images Plus 4.0 for camera control, calibration, stacking, digital development and smoothing. Photoshop CS5 used for color correction, levels and curves, saturation adjustments, lens correction, and lab color. Carboni Tools for additional saturation adjustments, noise reduction, Local Contrast Enhancement, Gradient Xterminator used to smooth background. HLVG for additional color correction. Notes The focal reducer I used appears to not flatten the field at all, so this is a crop from the full frame. I was able to correct most of the edge distortion with Photoshop's Lens Correction tools. I had just performed a very good collimation on the scope, and the seeing was excellent throughout the exposures. As such, I am extremely happy with the very sharp stars and good resolution in this photo.